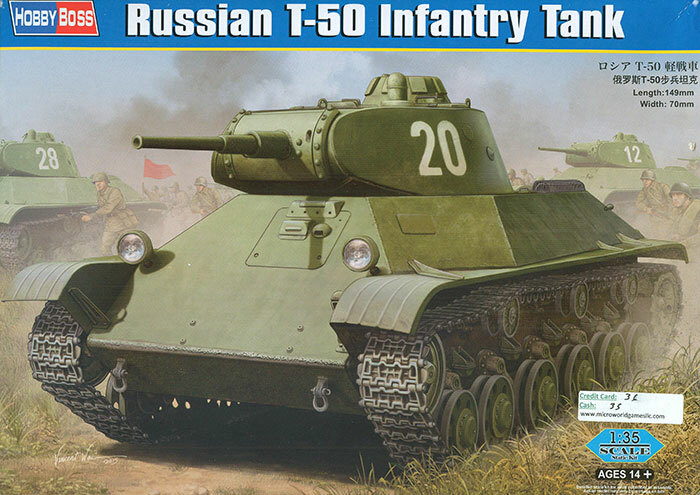 Recommendation: Highly Recommended for Soviet and light tank fans. While Zhosef Kotin was working to corner the heavy tank sector in the Red Army he did not forget about lighter vehicles. He felt that a good all around replacement for the aging T-26 series would also push the upstart T-34 tank to the sidelines and therefore put the competing design teams under his direction to work on a new light tank design. Both teams came up with similar tank designs, both using the 45mm tank gun and the new V-4 diesel engine, a six-cylinder design which was essentially half of the famous V-2 diesel. The first version, Article 126, was from S.K. Ginzberg at Factory No. 174 but was rejected in favor of Article 211 from SKB-2 under A.S. Yermolayev at the Leningrad Kirov Factory. The tank was dubbed “Maliy Klim” by some due to its resemblance to the running gear of the KV-1. But due to bad timing and the start of the war locking down production of main types already in full production the T-50 tank only saw about 70 built and of those only 48 were armed. Some were upgraded with applique armor (s ehkranami) but most were not. Only two tanks survive today, one in Finland and one in Moscow. The T-50 came out in kit form a number of years ago from Mirage and was then upgraded by Techmod with an excellent sheet of etched brass including preformed air intake grills for the radiator intakes; these were a unique shape and this made the Techmod versions of the kit the one for most serious modelers. Now HobbyBoss has released a highly detailed kit of this unique offshoot of the Kirov school of armor design. It is typical for HobbyBoss with a huge number of two-piece single link tracks, all of which are about the size of a medium tank in 1/72 scale. The separate teeth make their assembly quite tedious, and while HobbyBoss gets points for accuracy it does not lend itself to the assembly experience for most modelers! This version is the production version and therefore it is likely HobbyBoss will release the uparmored version as well for mold amortization, probably with the Finnish markings associated with the Parola survivor. This also shows in the fact that step 2 is drilling holes from the inside of the upper hull for detail attachment points. Assembly is quite detailed with etched brass rings for the idlers and all bump stops on the lower hull as separate parts. While there are positive locking features on the road wheel arms (wedges) care must be taken in their alignment. The kit tracks provide 128 links per side with only 93 indicated as needed, but the teeth are so small it is likely you may need the extras to replace the ones lost to the “carpet monster”. Note that there are FOUR types of links (two per side); two of each kind have the bolt head on the inside and a nut on the outside (I think - I used a 10x loupe and that is what it looked like) and one track is for the “flat runs” and the other for the “wrap” sections. For the life of me I cannot tell them apart! The section of brass wire is for lift rings for the engine access hatch at the rear of the hull. The only real bugaboo will be using the kit provided etched brass grills for the air intakes (parts PE 24 and 25) as the kit does not provide a former for the domed shape. The best advice I can offer is to take the kit stryene parts (parts G31 and 32) and sand them smooth then form the brass over them. These are quite obvious on the original vehicle and most modelers - no matter how well they can paint and finish - would be disappointed with the results using the stryene ones. The turret provides a complete DT machine gun and drum for the turret - but then not a bit of interior anywhere else! Go figure. Finishing directions provide for one Soviet vehicle in what appear to be parade markings with red stars and white 20 markings. Overall this is a nicely done if overwrought kit but I think the tracks may bore modelers into putting back on the shelf which would be a shame.